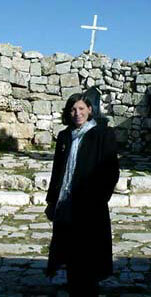 Message on Palestinian Christians in the Holy Land by Maria C. Khoury, Ed. D.
The Web Site for The Greek Orthodox Church of Taybeh now has a new mailing list. Join now its fast and easy. Just click on the following link. At the Church of the Holy Sepulchre, the last few stages of Jesus' journey to the cross are realised. The Church marks where Christ was nailed to the cross, where He died and finally where His body was laid in the tomb. This is where Jesus laid for three days and is the very place where He was resurrected. As such it is the most precious site in the world for Christians to visit today. I have been coming to the Holy Tomb for the last twenty-four years but in the last eleven years I have been living full time in the small village of Taybeh, the only all Christian village left in Palestine twenty minutes outside Jerusalem. Our Christian community is a small dwindling one, but it seeks solidarity with Christians from all over the world to come and venerate this holy site where the Lord experienced His passion, His crucifixion and His holy resurrection. It should be a spiritual journey of a lifetime that every believer should hope to undertake. There are many reasons why a Christian would want to venerate this holy place, essentially it can be an experience of deepening ones faith and glorifying God in the very spot of His Holy Resurrection. One might ask though, how is this possible and what role does it play today -- The dwindling Christian community might ask itself the same question -- what role do we play? For the tomb seems like a contradiction -- it is empty, yet it is life giving. Our community is small, but has within its reach sites of such significance. The significance of the Tomb being referred to as the "Life-Giving Tomb," is that Christians seek a life with Christ which is not of this world but of God's Heavenly Kingdom, our Promised Land is Paradise. If we choose a life with Christ and place Him first in our lives then earthly and material things seem less important. Life with Christ becomes a focus for the individual and more important to pursue. These Christian values and beliefs can help to promote non violent resolutions to the conflict and violence all around us. Thus, we come and venerate this holy site seeking forgiveness of sins and seeking life with Christ for eternity. Christians learn from the Creation story in Genesis that man was created in the image of God and lived in communion with God, until he broke that communion and was expelled from the Garden and became subject to death. So, the question becomes, "How do we return to communion with God? How can we get back to that place where we can talk to and walk with God? Many feel that there's a void within, a void that can only be filled by communion with our Creator. It is the Life-Giving Tomb that reminds us that the barrier between God and man was removed by Christ's resurrection. When one walks the footsteps of the Lord, this is the message that reaches the soul. That all darkness can be overcome by God's love and God is here for us. If ever one needed an indication of how relevant and powerful this message is, one need look no further than Holy Saturday, when many from the Christian community in Jerusalem gather to witness the greatest of all miracles "the Miracle of the Holy Fire. The Miracle of the Holy Fire is the celebration of Christ's resurrection, when the flame miraculously appears, literally, from within the marble stone tomb. This is the uncreated light of God not God Himself. It is received by the Greek Orthodox Patriarch as it has been done every year, on the same day, in the same manner, at the same time, at the same holy place of Christ's Life-Giving Tomb. Sometimes it can be a gathering of chaos with the soldiers, the police, the large crowds, the noise, the drums of the Boy Scouts and the Girl Scouts anxiously waiting to receive the light outside the Holy Sepulchre. 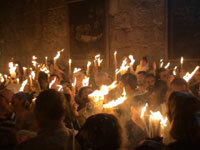 During peaceful times, representatives of many churches from all over the Holy Land come to receive the Holy Fire and carry it back in small lanterns to their particular churches for the Midnight Resurrection Service. Even now, many local people go to great extremes to get the proper permits in order to partake in this centuries old celebration that reflects our Christian heritage and deep roots in Palestine.All lights, candles and vigil lamps are put out at the start of this ceremony. The Holy Fire is physically apparent as a blue mist, a moving cloud in the air and the words "Christ is Risen" are chanted in many languages as the light is quickly distributed to everyone present. The light that proceeds from the core of the stone that covers Christ's Life-Giving Tomb has been celebrated as one of the oldest unbroken Christian ceremonies that exist in the world today. Some people find it hard to comprehend what happens, just as people find it hard to comprehend the eternal love and presence of God. It therefore takes faith to believe in the significance of the Holy Tomb. Christians appreciate that they have a holy place that is the remembrance of Christ coming to earth to reconcile us to God and God to us. The very spot were victory was shown over death by Christ's resurrection.This is the miracle that allows us to know that Christ is in our midst. This is the miracle that allows us to feel that Christ is truly among us. This miracle is another way that God communicates to us as a community our role to the world today. As we remember when we chant in our Midnight Resurrection Service: "Come ye and receive light from the unwaning Light, and glorify Christ, Who a rose from the dead." When you glorify Christ you begin to hear the gospel message and practice it. As a small Christian community in the Holy Land we have a duty to share this message with the entire international community. To give hope to people that might be suffering from darkness in other corners of the world. At the Orthodox Easter service we sing:"You arose, O Christ, and yet the tomb remained sealed, as at Your birth the Virgin's womb remained unharmed; and You have opened for us the gates of paradise." During the ceremony, Orthodox Christians remember that Christ is the One Who has smashed the gates of Hades and opened the gates of Paradise, and gone before us! Seeing the Life-Giving Tomb of Christ is another reminder of our final destiny. As a small Christian community we want to witness and reflect Christ's eternal love. We pray for peace and hope Jerusalem can be an open city of all faiths so Christian pilgrims from all over the world can come and be inspired and spiritually uplifted by the true Light of Christ and share the richness of the Christian roots that exist in the Holy Land. The Myrrhbearing Women who came to the Holy Tomb over two thousand years ago may have wondered who was going to roll away the stone. Later on, they may have even wondered whether it was Jesus or the angel who did it. Either way, it doesn't matter. The stone wasn't rolled away so Christ could get out. Rather, the stone symbolizes death and the barrier that existed since the original sin between man and God. Through our annual recollection of Christ's passion and holy resurrection, Orthodox Christians are physically reminded that once again that this barrier between God and man is removed, now and forever! For us, the stone symbolizes the boundary between the living and the dead, between those who are dead in sin, which are separated from God, and those who are alive in Christ and growing in union with Him. This is the message the Life-Giving Tomb has for the world today. St. Peter says, in his first Epistle, that God has called us out of darkness into his wonderful light. Also, St. John wrote: "Then Jesus spoke to them again, saying, "I am the light of the world. He who follows Me shall not walk in darkness, but have the light of life.'" (Jn. 8:12). The significance of Christ's Life-Giving Tomb is a reminder of this call to be in the image and likeness of our creator. To fill our souls with God's love since God is love. To fill our hearts with God's grace thus fostering understanding ndcompassion. To answerthe call to be in the image and likeness of God means, more than anything else, that we must love with a perfect love. In this Holy Lenten Season, the Life-Giving Tomb of Christ can serve as a reminder that no matter what we have done, how badly we may have suffered or what deep pain we may have experienced, we too have a chance for a new life with Christ, an everlasting life. It shows that no matter how small and seemingly insignificant, we have a purpose and that through commemorating Christ's holy resurrection, we too can rise up with a pure heart, a cleansed soul and a new life in God. 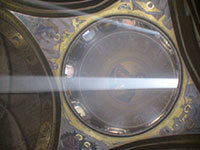 Note: This article was recorded for the BBC Radio Annual Lenten Talks at the site of Christ's Holy Tomb in Jerusalem.